An Otis Carey still from Satan Surfs. If Satan surfs as well as Otis, hell will be a great show. This is an awful sentence in just about every way imaginable. 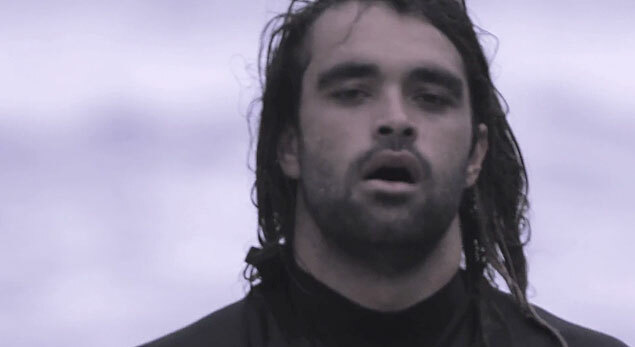 And, to be fair, Australia Surfing Life has issued an unreserved apology on the matter. It’s sincere. The question is: should we condemn it as racist? I don’t know Myers, so I can’t speak for his character or his beliefs, but I’m familiar with his work and most of it is miles better than this. In fact, from what I’ve read, even the rest of the story is miles better than this. Whatever else it may be, it’s not, in my opinion, the work of a “racist.” It’s the work of a man who made a terrible, but honest mistake – in other words, Myers wrote something racist by accident. On the face of it, this sounds ridiculous, but it’s much more common than you might think. Language is laced with derogatory descriptions and when we deal with those unlike us, they tend to come out even when there is no derogatory intent. Words like “mulatto” and “half-caste” to describe people of mixed racial descent are, for instance, still regularly employed by well meaning, if slightly oblivious people. Furthermore, there are no rules other than long and often-obscure histories to dictate which words are part of polite vernacular and which words are inherently insulting. Here’s an example: I have a general belief bordering on prejudice that an aquiline nose – a la Patrick Rafter – is a common facial feature of white Australian men. Like the term apeish, aquiline is an animal reference, deriving from the latin aquila, for eagle. If I used it to describe a white Australian, as in “beads of water dripped off of Joel Parkinson’s aquiline nose,” there wouldn’t be anything particularly un-kosher about it. Why is it that one type of person can be compared implicitly to an animal while another cannot? The answer to that lies in the history of language, literature, symbolism and indeed, the very idea of knowledge. Comparing people’s facial features to apes has a well documented history which hit its high water mark the pictographic racial hierarchies that were considered hard science in the 19th and early 20th centuries. These hierarchies typically showed a series of faces or skulls ranked according to erroneous notions of evolutionary development. At the pinnacle sat faces pulled from classical Greek sculptures that were then considered to hold the key to ideal facial symmetry and, therefore, beauty. Western Europeans and Nordic people came next, followed by Spaniards and other continental Europeans, and so on and so forth until, at the bottom, sat an African face just above that of an ape. Such hierarchies and the beliefs they purported to prove were used to justify the horrors of slavery, the colonization of Africa, and Jim Crowe, among many others. In the case of Australia, the supposed un-evolved, or ape-like state of the aborigines was used to rationalize government sponsored extermination which officially lasted in various iterations until the 1970’s when the last programs to remove aboriginal children from their birth parents were abolished. Interestingly, these hierarchies were also used to show the supposed degeneracy of certain groups of what we now consider “white” people, like Eastern Europeans and the Irish. The real sin that Myers committed was not trying to sell anyone on a false argument about the inferiority of a certain type of person – which is essentially what all racism amounts to. His sin was simple negligence. He wrote about a man of Aboriginal descent without doing his homework on the ways in which such people have been described in the past. In doing so he fell into an old trap without realizing it: when describing something unfamiliar, he used a lazy, short-hand sketch instead of what his eyes actually saw. Just look at Carey. I mean, really look at him: he doesn’t look like an ape in any way shape or form. Yes, he has heavy brow which could be called “apeish” but it could also just be called a heavy brow, a strong brow, or a brow you could break rocks over. I am not suggesting for a moment that Myers is a lazy writer. But he wrote a lazy sentence and it just happened to be about a very sensitive subject. Although it’s natural to feel viscerally offended by his words, it’s important to keep in mind that he thinks enough of Carey to feature him in his surf film, to put him in an article for a large surfing publication and write positive things about him. Myers has given a lot to surfing, and if we really want our culture to grow and progress for people of all descents and backgrounds, we need to allow for some of these types of blunders as we take nervous, faltering steps into a more racially mixed future.